Rental licensing and inspection remains a topic of substantial interest at Western Washington University where over 8,000 students plunge into Bellingham's rental market each year. This mass of renters vie with local residents for the estimated 17,000 to 18,000 rental units within the city limits. The closer to campus, the better and the less expensive, the better. That sets up a dynamic akin to a game of musical chairs but with financial implications as this demand tends to drive up prices and create an atmosphere conducive to poor conditions. 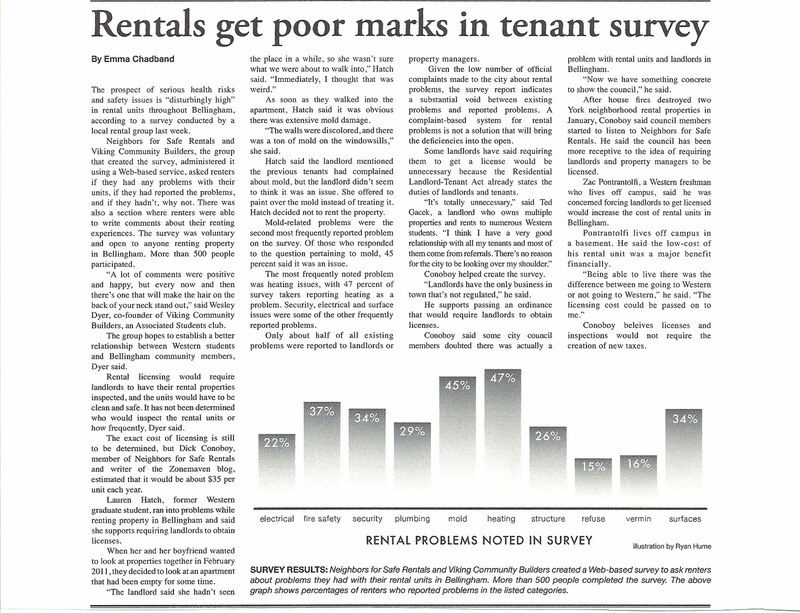 With the recent publication of a survey on rental conditions by the Viking Community Builders and Neighbors for Safe Rentals, Western Front student journalist Emma Chadband reviewed the findings and wrote an article, Rentals Get Poor Marks in Tenant Survey, that appeared on April 19th. The article is available by clicking on the image at left. The appearance of the article is timely in that this is the season during which most of the students are seeking housing off-campus for the next academic year. Perhaps, in some small way, the information on rental conditions will spur some students and their parents to ask hard questions about the condition of these rentals. In the long run, the most effective mechanism to ensure that rentals are safe is to have a mandatory licensing and inspection ordinance. Survey on Rental Conditions - "Bellingham, We Have a Problem." 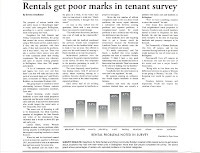 Among other items, the survey asked the renters to respond to 10 questions regarding the condition of their rentals. The health and safety categories were: electrical, fire, security, plumbing, mold, heating, structure, refuse, vermin and surfaces. The following table provides the data on these categories. The combined total at the column to the right represents the totality of the specific problem whether the problem was reported and not acted upon or not reported at all. In either case, the health safety issue was not addressed. A comprehensive licensing and inspection program would discover and correct these potentially dangerous conditions. Additionally, there are those health and safety issues that are not recognized by either the renter or the landlord which suggests that the percentage of these problems may be even higher each category. The fact that 64% of renters,who responded to the survey were satisfied with their rental indicates that the respondents were not taking the survey merely because they had a bad experience. Nonetheless, 28% did state that their landlord/property manager was ineffective in responding to complaints and 28% said that their landlord/property manager was simply unresponsive. Not surprisingly, a majority (65%) of those responding were students renters who number in excess of 8,000 per year in a market of over 17,000 rental units. "Results from the rental survey suggest that many buildings would have failed inspection at the time of the survey. Many of these code violations represent an immediate threat to health or safety. Given the low number of official complaints that are made to the city, this survey indicates a substantial void between existing problems and reported problems. A “complaint based system”, as exists now, is not a solution that will bring the deficiencies into the open. Rental housing stock needs oversight and enforcement to correct substandard housing and to motivate unresponsive landlords and rental management companies to make repairs." *Additional assistance in publicizing the survey was provided by the student club, Western Democrats of Western Washington University.